Joel Matip and Felipe Santana compete for a spot at centre-back. Sead Kolasinac could start at left-back again, with Dennis Aogo switching to the position in central midfield. Jermaine Jones and Leon Goretzka are the first options should manager Jens Keller decide to rest one of his starters. Sebastian Prödl is still injured and will be replaced by Assani Lukimya at centre-back again. Franco Di Santo returns from injury to start up front. Otherwise, manager Robin Dutt could field an unchanged team. There have been over 2.5 goals scored in 13 of Schalke’s last 14 home games in the Bundesliga. Schalke have won their last 4 matches against Werder Bremen in all competitions. 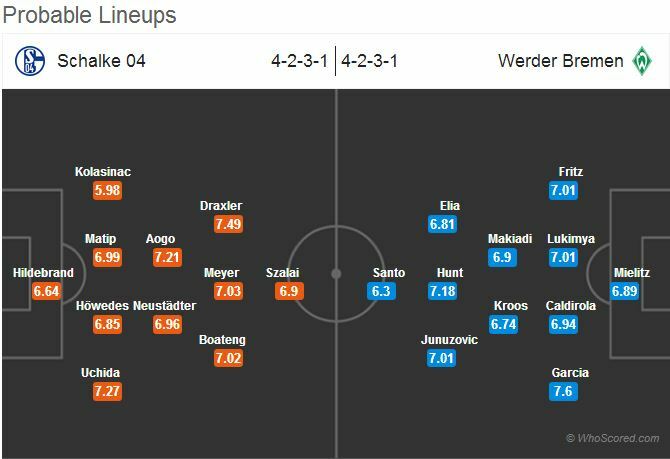 Schalke have scored at least 2 goals in their last 4 matches against Werder Bremen in all competitions. 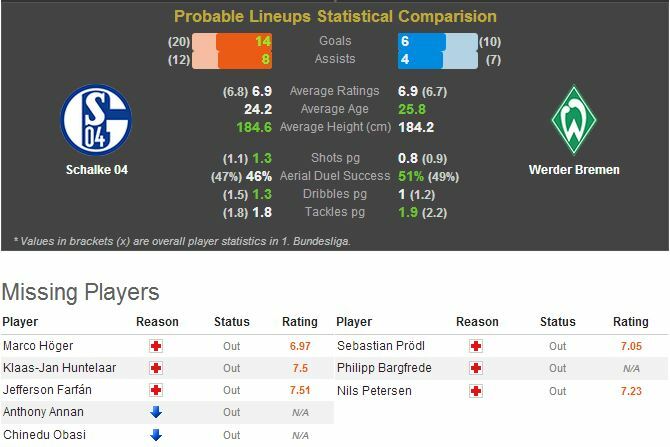 Schalke have seen over 2.5 goals in their last 3 home matches against Werder Bremen in all competitions. Schalke bounced back from the derby loss against Dortmund a fortnight ago with a strong win at Hertha last weekend. Manager Jens Keller is still under huge pressure though and needs a result against Bremen. Bremen are back on track after a last minute win against neighbours Hannover last weekend. With the return of Franco Di Santo, they finally have a natural striker available again. Expect this to be an open and competitive game from the outset.